The events and exhibition guide for Tenerife and Gran Canaria. Two National Holiday days fall at the start of December: the 6th (which is a Sunday so the holiday is carried forward to the 7th) and the 8th. Banks and some shops may be closed. 8pm: German Romanticism, classical music concert by Augusto Canto, accompanied by Javier Lazo, Schubert’s Winterreise, €15, Liceo de Taoro, in front of the Plaza de Constitución, La Orotava. info@liceodetaoro.es. 5pm: Cake making workshop (Christmas Treats), Casa del Vino de Tenerife, Calle San Simón, 49, El Sauzal, organised by Pastelería Díaz. 922 626 202/atencionalcliente@pasteleriadiaz.com. 4pm and 6pm: Peppa Pig – Treasure Hunt, puppets, (in Spanish) from €19, (under 1’s free), Auditorio Infanta Leonor, Los Cristianos. entrees.es/. 8pm: Gospel Canarias Festival, The Latonius Gospel Choir, Free entry, Iglesia de San Antonio de Padua, Granadilla de Abono. 8.30pm: Gospel Canarias Festival, Chicago Mass Choir, A Spiritual Tribute to B.B. King, Tickets €8 advance purchase, €10 on the night, Auditorio de Guía Isora. www.gospelcanarias.com. 8.00pm: Gospel Canarias Festival, Chicago Mass Choir, show as above, From €12, Teatro Leal, La Laguna. entrees.es. 8.30pm: Swan Lake, ballet, Moscow Ballet Company, Tickets €29-€38, Teatro Guimerá, Santa Cruz. www.teatroguimera.es. 8.00pm: Gospel Canarias Festival, Chicago Mass Choir, La Laguna, as above. entrees.es. 8.30pm: The Nutcracker, ballet, Moscow Ballet Company, Tickets €29-€38, Teatro Guimerá, Santa Cruz. www.teatroguimera.es. 8pm: German Romanticism, classical music violin concert by José Luís Gómez, accompanied by Javier Lazo, Brahms and Bonin, €15, Liceo de Taoro, in front of the Plaza de Constitución, La Orotava. info@liceodetaoro.es. 9pm: Eclipse, reggae concert, €10, Teatro Leal, La Laguna. www.teatroleal.com. Hiking, Historical wine route of Tegueste. 922 316 102. All day: Cinema festival with showings of short films (mainly in Spanish), Museo de la Naturaleza y el Hombre, Free, Santa Cruz de Tenerife. santacruzcineyred.com. 5.00pm-1am: Christmas market, sports events, bouncy castles, story-telling (in Spanish), workshops, music, theatre etc. Calle Grande, Adeje. 9.30pm: Gospel Canarias Festival, The Latonius Gospel Choir, Free Entry, Plaza de España, Adeje. 8pm: Jubilation Gospel Choir, concert, Tribute to Ray Charles, €23, Auditorio Adán Martiín, Santa Cruz. auditoriodetenerife.com. Sushi, El Jinete sin Cabeza Restaurante, Bencomo 23, La Laguna. 622 886 288/eljinetesincabeza23@gmail.com. 8pm: German Romanticism, classical music, violin concert by the Orquesta del Conservatorio Superior de Canarias, conductor José María Vicente, soloist Javier Lazo, Beethoven and Schumann, €15, Liceo de Taoro, in front of the Plaza de Constitución, La Orotava. info@liceodetaoro.es. Vote for your favourite tapas, enter the prize draws. See the brochures for full details, available from participating establishments, town halls and information centres. Until December 6: Guía de Isora, Thursday to Sunday, 28 bars and restaurants offer a tapa and a drink (water, soft drink, beer, wine) for €2.50, some only available during specific times of the day. Until December 13: Daily, 34 bars and restaurants are taking part in the Granadilla de Abona tapas route. www.sensacionesgranadilla.com. Every Monday and Wednesday: Yoga for Children, 5.30pm - 6.15pm, Caracola Espacio En Movimiento, Calle San Agustín 5, La Laguna. 610 630 765/caracolaespacioenmovimiento@gmail.com. Every Tuesday: Tour of Dorada beer factory, Avenida de Ángel Romero, Santa Cruz. doradatour.es. Every Thursday, Friday and Saturday: Canarias Folk Fest, parade, regional costumes, traditional dancing, singing, crafts and tastings in Las Galletas and Los Cristianos. Thursday – Rambla Dionisio González, Las Galletas, Friday – Avenida Las Américas (Golden Mile), Playa Las Américas and Saturday – Plaza de la Pescadera and Paseo Marítimo (Avenida Juan Alfonso Bautista), Los Cristianos. Thursday and Saturday, 5pm - 8.30pm, Friday 8.30pm. Every Saturday morning: Events for specific groups, families, seniors, women etc., Activate Sports Club, opposite the entrance to the Baobab Suites, Calle Roques del Salmor, Costa Adeje. www.tenerifeactivate.com. Until December 3: Pasión Isleño, photographs by Alexis Martín Padilla, Free entry, Casa de la Juventud, Adeje, Monday to Friday, 10am-1pm and 5pm – 8pm. www.adeje.es. Until December 13: Aedificator, urban reflections in modern sculptures, Javier de la Rosa, Free Entry, TEA, Santa Cruz de Tenerife, Tuesday to Sunday, 10am - 8pm. www.teatenerife.es. Until January 17: Los Objetos Hablan (Objects speak), paintings and objets d’art on loan from the Museo del Prado, Madrid. Includes works by Rubens, Sorolla, Zurbarán, Murillo, Goya and Ribera, Free entry, Monday to Friday, 11am - 2pm and 5pm - 8pm, and Saturday 10am - 2pm. obrasocial.lacaixa.es. Until January 31: Vivencias de la cumbre (Living in the hills), photography, a collection of old Tenerife pastoral hill scenes, beekeepers, snow collectors, goatherds, charcoal makers etc., TEA, Santa Cruz de Tenerife, Daily, 9am – 8-30pm. 8.30pm: Autumn Jazz Festival, Luis Merino 4tet, €10, Teatro Guiniguada, C/Mesa de León, LPGC. 8.30pm: The Nutcracker, ballet, Moscow Ballet Company, From €29, Auditorio Alfredo Kraus, LPGC. www.entradas.com. 8pm: Guided wine tasting, €6, Plaza Tifariti (booking required), followed at 9pm by wine and tapas stalls with live music, Avenida Juan Carlos I, Valsequillo. 928 705 011 Exts 0622/0629/0630/0632. 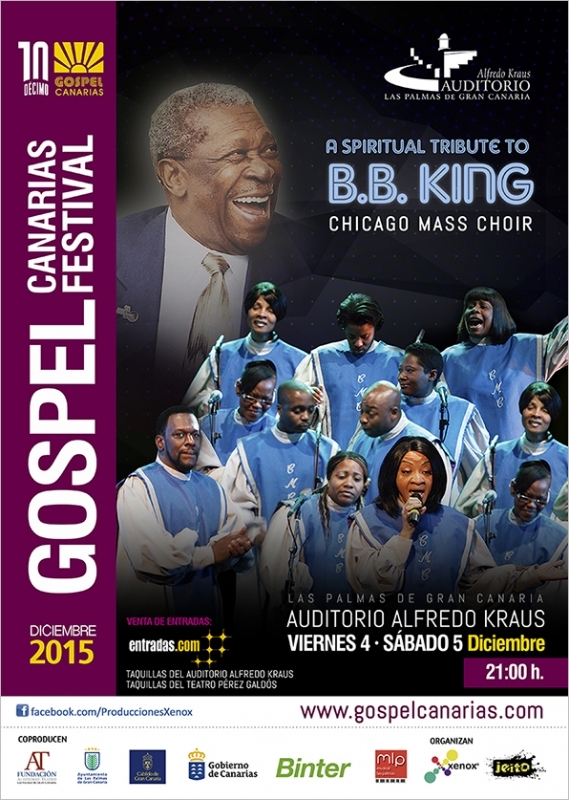 9pm: Gospel Canarias Festival, Chicago Mass Choir, A Spiritual Tribute to B.B. King, Tickets from €15, Auditorio Alfredo Kraus, LPGC. www.entradas.com. 9pm: Boleros and Tangos, Free concert, Terraza Cayrasco, Plaza de Cairasco, LPGC. 12pm, 4pm and 6pm: Peppa Pig – Treasure Hunt, puppets, (in Spanish) from €15, (under 1’s free), Centro Civico Carrizal, Ingenio. entrees.es/. 12.30pm: Dale al Play, Orquesta Filarmónica de Gran Canaria play themes from videogames, €5, Auditorio Alfredo Kraus, LPGC. www.entradas.com. 8.30pm: Abba Live, Golden Tribute, €10, Teatro Guiniguada, LPGC. 9pm: Gospel Canarias Festival, Chicago Mass Choir, as above. 10.00am - 2.00pm: Avocado fair, live music, parades, craft stalls, children’s workshops, Free entry, Plaza Pérez Galdós, Arguineguín, Mogán. 7.30pm: Swan Lake, ballet, Moscow Ballet company, From €35, Teatro Victor Jara, Vecindario – Santa Lucía de Tirajana. www.entradas.com. Afternoon: children’s workshops, magic, craft stalls, in favour of Ansina disabled association, Local Sociocultural, Vega de San Mateo. 9pm: Guitar music, Free concert, Terraza Cayrasco, Plaza de Cairasco, LPGC. 10.00am - 8pm: Christmas Market, workshops, bouncy castles, magic act at noon in the Plaza del Pino, Vega de San Mateo. 8.00pm: Organ concert by Mar Tejadas, Free entry, Iglesia de San Sebastián, Agüimes. 10.00am - 8pm: Christmas Market, as above, Vega de San Mateo. 11.30am: Concert by the Bands of the A.C. Guayedra de Agaete and A.C. Aires de La Aldea, Teatro Pérez Galdós, LPGC. 928 433 334. 8.30pm: Beatles Tribute, Auditorio Alfredo Kraus, LPGC. Every Sunday until December 25: 11.30am, Traditional Canarian dancing and singing, Free entry, Pueblo Canario, Calle Francisco González Díaz, LPGC. From December 4 until January 7: Stunning sand nativity scene, Free entry, Playa de Las Canteras, LPGC. Until January 10: Black Hole, a collection of pastels and charcoals by local artist Raúl Artiles, CAAM (San Antonio Abad), Tuesdays to Saturdays, 10am – 9pm, Sundays, 10am – 2pm, LPGC. www.caam.net.